2018 Jeep Renegade Review | Orchard Chrysler Dodge Jeep Ram " "
The Jeep nameplate is the most iconic for off-road capable and rugged vehicles, even in its entry-priced SUVs. That’s completely evident with the Jeep Renegade. It’s a cost-effective 4×4 with awesome function and features including advanced safety and technology options. The 2018 Jeep Renegade makes great advancements with new tech while staying true to all things Jeep. 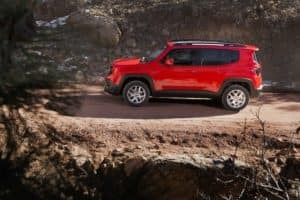 Here are five notable features for the 2018 Jeep Renegade, available at Orchard Chrysler Dodge Jeep Ram in Washington, MI. Staying connected is easier with the Jeep Renegade thanks to Uconnect 4. New for 2018, Jeep’s Uconnect 4 with 7-inch display is standard on Jeep Renegade Latitude, Limited, and Trailhawk trims, and is optional for the Sport trim. It features Apple CarPlay and Android Auto, Bluetooth, and integrated voice commands. For the Renegade Latitude, Trailhawk, and Limited trims, an even more amazing system is available as an upgrade. Choose the Uconnect 8.4 radio with navigation, an 8.4-inch capacitive touchscreen, and all the connectivity options you want. When open-air driving is what tickles your fancy, the Jeep Renegade is happy to oblige. All Renegade Latitude, Trailhawk, and Limited trims have an available CommandView Dual-Pane Panoramic Sunroof for that fresh-air experience. A power sliding glass front panel, fixed rear panel, and a power sunshade give you options for your drive. Or, choose the My Sky Removable Panel Sunroof, also available on the Sport trim. This dual-pane sunroof option allows you to fully remove the two panels, retract one like a standard sunroof, or close-up for a glass ceiling experience. You and your passengers can be more confident inside the 2018 Jeep Renegade due to enhanced safety systems. The Renegade offers up to 70 safety and security features including the segment-first availability for Forward Collision Warning-Plus and LaneSense Departure Warning-Plus. Like all Jeep models, the 2018 Jeep Renegade is engineered to traverse the toughest terrains. The Jeep Renegade Trailhawk includes Jeep Active Drive Low for awesome crawling abilities. It has standard skid plates, signature red tow hooks front and back, Hill Descent Control, and 8.7 inches of ground clearance. All Renegade trims equipped with 4×4 include Selec-Terrain with up to five modes for the ultimate in 4×4 performance in all weather conditions. Among the six trim levels, there’s the right fit for technology and convenience features for everyone. Options include HD Radio, SiriusXM Radio, BeatsAudio premium sound with eight speakers and a subwoofer, and three different Uconnect infotainment systems. Inside, choose comforts like heated seats and a power-adjustable driver’s seat, leather trim, and a 7-inch full-color Driver Information Digital Cluster Display. Dual-zone automatic temperature control, a heated steering wheel, and ParkSense Rear Park Assist System with Rear Cross Path Detection are options that elevate your in-car experience. The 2018 Jeep Renegade sets the standard for compact 4×4 SUVs today. With all the technology, comfort, and capability you can handle, you’ll find the Jeep Renegade available in Washington, MI at Orchard Chrysler Dodge Jeep Ram.